JAL adds Jetstar Japan as JAL Mileage Bank partner. 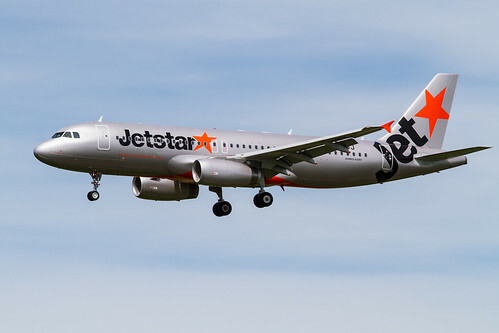 Image by ken H.
Japan Airlines (JAL) announces that JAL Mileage Bank (JMB) members will be able to earn and redeem miles on Jetstar (GK) from October 9 2013. Even though JAL also owns part 1/3 of Jetstar Japan, you still won't be able to earn FLY ON Points on flights operated by Jetstar Japan, only redeemable mileages could be earned. Passengers traveling with "Plus" and "Max"fares will earn 25% of the sector miles, while those with "Starter" fares will not earn any miles. Note that this only applies to flights marketed and operated by Jetstar Japan, i.e. GK coded. Other Jetstar sister airlines are not part of this agreement. Apart from earning redeemable miles on Jetstar Japan's flights, you will also be able to redeem miles on those flights as well. JAL Mileage Bank redemption table for Jetstar Japan. Image by Japan Airlines. For now, Jetstar Japan only operates domestic flights so only domestic redemption table is provided. The redemption rates are the same as the discounted redemption rates on JAL domestic flights. So not really a good deal unless you have to fly and JAL flights are full or you want to fly outside of the discounted promotion period. But still, I would rather fly on JAL for Sky Time :P Later, I would expect Jetstar Japan to be added to the partner redemption award once it expands internationally. I guess these are just the extra incentive for JMB members to fly on Jetstar Japan if they have to fly on a domestic low cost carrier (LCC). Maybe they are doing this in preparation of the (re-)launch of ANA's Vanilla Air which is also based in Tokyo Narita (NRT).